ERIE, PENNSYLVANIA: Site of the new general purpose ERI Foreign Trade Zone (ERI FTZ), located on Tom Ridge Field at Erie International Airport (ERI). The new ERI Foreign Trade Zone warehousing and distribution facility is located at Erie International Airport. ERI FTZ was accomplished in cooperation with ERI, Port Erie, and Logistics Plus. ERI executive director: “We are a capable hub for air cargo and global commerce." 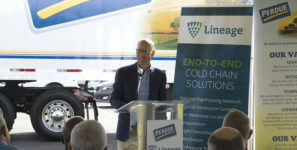 A new-general purpose foreign trade zone (FTZ) warehousing and distribution facility was opened at Tom Ridge Field at Erie International Airport (ERI). The ERI FTZ was accomplished in close cooperation with the airport, the Erie-Western Pennsylvania Port Authority (Port Erie), the Grantee of Foreign Trade Zone #247, and Logistics Plus, a provider of freight transportation, warehousing, global logistics, and supply chain management solutions. Port Erie and ERI filed applications and received grants of authority for Foreign Trade Zone status from the U.S. Foreign Trade Zones Board in Washington. Under a contractual agreement with ERI, Logistics Plus filed and secured activated status for the site from Customs & Border Protection (CBP) and will operate FTZ warehousing and distribution facilities on the airport property. Thousands of U.S. businesses have discovered that foreign trade zone utilization can prove to be an effective tool to help develop new markets while systemically increasing profitability from both their existing operations and international trade relationships. CBP has declared FTZs to be the best practice for compliant management of global supply chains, coordinated logistics, and integrated manufacturing operations. FTZs enable importers and exporters to consistently benefit from this CBP-privileged status; offering duty savings, reduced transportation and insurance costs, and the flexibility to do in the U.S. what is too often done off-shore. This includes packaging, kits, labeling, sorting, assembling, processing or manufacturing. If the finished products are exported from an FTZ, the original customs duties are reduced.